We are delighted to welcome Tamás Biró as a new lecturer in our department. This fall he will be teaching Phonology I and Facets of Hebrew and Semitic Linguistics, and in the spring, he will teach Language and Computation and a seminar on computational Optimality Theory. Originally from Hungary, Tamás earned three MA-equivalent diplomas (in physics, Hebrew studies, and theoretical linguistics) from Eötvös Loránd University in Budapest and an MA in Jewish civilization from the Hebrew University of Jerusalem. 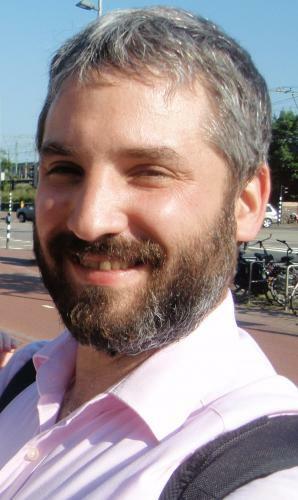 In 2006, he completed a PhD in computational linguistics at the University of Groningen in the Netherlands. He has spent the last four years in Amsterdam as a postdoc on his own project, financed by a grant by the Netherlands Organization for Scientific Research. His research interests lie primarily in learnability and computational aspects of Optimality Theory but also include Hebrew and Semitic languages and cognitive approaches to culture and religion. Please be sure to introduce yourself to Tamás and make him feel welcome!